A simple (but flexible enough for most uses) particle system is provided. Particle systems are used to simulate complex physical effects, such as sparks, fire, magic particles, smoke, mist, etc. The idea is that a “particle” is emitted at a fixed interval and with a fixed lifetime. During its lifetime, every particle will have the same base behavior. What makes each particle different from the rest and provides a more organic look is the “randomness” associated with each parameter. In essence, creating a particle system means setting base physics parameters and then adding randomness to them. 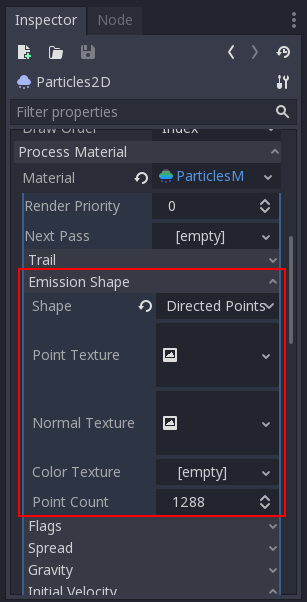 To add a process material to your particles node, go to Process Material in your inspector panel. 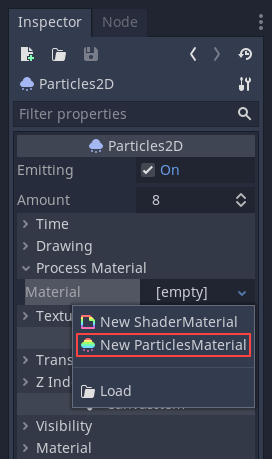 Click on the box next to Material, and from the dropdown menu select New ParticlesMaterial. The time in seconds that every particle will stay alive. When lifetime ends, a new particle is created to replace it. 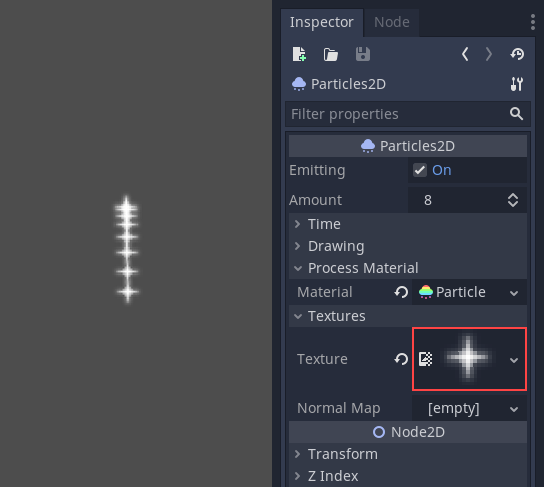 When enabled, a Particles2D node will emit all of its particles once and then never again. 0: Emit particles at regular intervals (default value). 1: Emit all particles simultaneously. The rectangle’s W and H properties respectively control its Width and its Height. The X and Y properties control the position of the upper-left corner of the rectangle, relative to the particle emitter. Linear velocity is the speed at which particles will be emitted (in pixels/sec). Speed might later be modified by gravity or other accelerations (as described further below). Orbit velocity is used to make particles turn around their center. The linear acceleration applied to each particle. Damping applies friction to the particles, forcing them to stop. It is especially useful for sparks or explosions, which usually begin with a high linear velocity and then stop as they fade. Determines the initial angle of the particle (in degress). This parameter is mostly useful randomized. Used to change the color of the particles being emitted. A dialog box with several settings will appear. Solid Pixels: Particles will spawn from any area of the texture, excluding transparent areas.  Border Pixels: Particles will spawn from the outer edges of the texture. Directed Border Pixels: Similar to Border Pixels, but adds extra information to the mask to give particles the ability to emit away from the borders. Note that an Initial Velocity will need to be set in order to utilize this. Capture from Pixel will cause the particles to inherit the color of the mask at their spawn points. 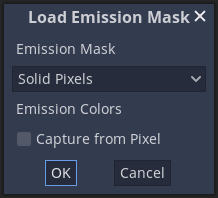 All of the values within this section have been automatically generated by the “Load Emission Mask” menu, so they should generally be left alone. An image should not be added to Point Texture or Color Texture directly. The “Load Emission Mask” menu should always be used instead.